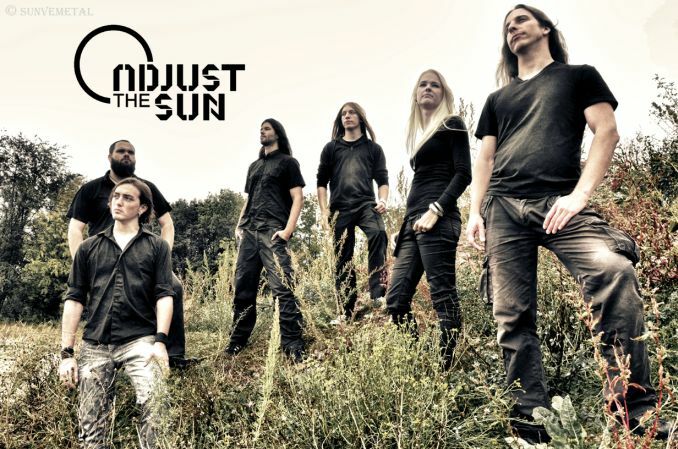 Adjust the Sun, a rising atmospheric death metal outfit from Germany, very recently self-released their debut EP Devouring Worlds. An integral component of Adjust the Sun's melodic formula are the keyboard accents of the talented Katrin, who graciously took some time to answer a few questions for Harvest Moon Music's Women of Heavy Metal interview series. [HMM] For readers who may unfamiliar with Adjust the Sun, would you introduce the band and describe your role? [Katrin] We are a six-piece melodic death metal band from Erlangen, Germany. Besides that, we also share some progressive influences. 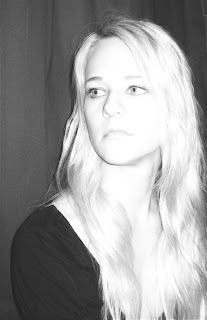 I am the “piano girl” and responsible for the “melodic” parts in our songs. When and how did the group come together, and is there a story behind the name Adjust the Sun? Sebastian and Benedikt were already playing together for a longer time, together with our former drummer. One day, I got a message in “studi-vz”, a German social network, from Sebastian, who I didn’t know. At first I didn’t know what to make of it and almost deleted the message because usually I only connect with people I already know from “real life” but this time I didn’t, and you could say it was fate. He said that he got my contact from a friend of his (Tim, our former guitarist), who said I was playing the piano, and he wanted me to come to a rehearsal because they were looking for someone to bring some melodic lines and sound layers to their songs. We did one rehearsal and after that I was in the band. We did great just right from the start. The band is a great bunch and I instantly felt good. The name “Adjust the sun” already existed when I joined and it is, as some have surely seen, an allusion to the song “Adjusting the Sun” by the Swedish death metal band Hypocrisy. However, we feel that the picture of “adjusting the sun” is very powerful. When something's not right you need to change perspectives and put things in their true light again. Sometimes that means a lot of effort. Our music is supposed to put things in perspective. Your debut full-length album Devouring Worlds was released digitally in May. How did the recording sessions go? The recording sessions really took some time. We started two years ago with basically nothing but our songs. The first recordings were done in our rehearsal room with only basic recording equipment and were not good at all. After that we decided to delete everything and start off again. The drums were the hardest part to record. Because they didn’t turn out with the quality we wanted them to have, Sebastian programmed them, beat by beat. The rest went better, and a few weeks later we had the raw material. Unfortunately, during those long two years, our singer, our drummer and our second guitarist left and had to be replaced. That was a hard time for the band and there were some points when we nearly disbanded. But in spring 2011 Markus, our new guitarist, just met two guys who were willing to mix our raw material. They were Michael “Mitch” Schmitt and Volker Batz from Railtrack Studios. They really did an awesome job! How long did it take to write the songs for the album? The songwriting was and is not difficult. Usually someone has got an idea and the others join in while someone is holding on to a riff. We just play and when we have found something that everybody likes, we record it so we can remember and rehearse. If we can rehearse regularly, one song needs only a few hours until it is finished. Songwriting in Adjust the Sun is really organic. I believe that it is due to the fact that we understand each other really well, after having played together for years. The songs for the album were written in only a few months. How has the reaction to the album been in Germany? Have you received feedback from other countries as well? We promote our album without the help of any label or agency so we have to use mouth-to-mouth propaganda and social networks like Facebook and Myspace, and of course our gigs. The reaction we got from our audience and friends, who really support us, was great and we hope that they’ll spread the word. Right now we got some review requests from South America, Hungary and Russia. We are overwhelmed by the reach our music has got! Your keyboard contributions play a large part in the band’s sound. How involved were you in writing the music? The main part in songwriting is clearly done by Sebastian who comes up with new riffs regularly. As I already said, our songwriting is done by all band members, nevertheless. Everyone can take part in the process by adding ideas and criticizing. My part usually is saying “no, you can’t do that – it sounds like a saw”. I can’t count the times how often I said this. Usually I’ve got the ideas for intros and outros of the songs and the parts that really are full of nice melodies. The outro of “Down”, for example, is my work and I really loved to find the bass lines and riffs and to combine them until they sound the way they do now. Sometimes, during the songwriting process, we find that parts of the songs need a little bit support so they sound delicate but powerful, though. Most of the times I add some strings or synth pads to them and they just turn out great. Sebastian does an awesome job and there is always room for me to squeeze in the odd little note or harmony. I see that you wrote the lyrics to album closer “Inner Autumn”. Would you explain the story or inspiration behind the words? I love this song like my own child, and actually the whole song was written by me. I had those riffs and melodies for a long time, almost for ten years, and finally they came together to that nice song because, with the band, I finally had the opportunity to make them great. The lyrics are really a part of “me” and are a retrospective of my life. They were written at a time in my life when things changed rapidly. The only constant was driving to work every morning. It was fall and I had to drive along fields that were covered by fog and you only could see schemes and silhouettes of the trees and hills. When the sun would break through it was really breathtaking. And finally I felt the peace that I needed. I accepted change and embraced it, hence the lines “I celebrate these times of inbetween”. When you can’t see clearly you are forced to have a closer look at yourself and your thoughts. In the end you might find out that you messed up and this really gives you icy stings. That is why the word “cold” stands out so prominently in the end. I believe that the metaphor of fall, or autumn, as I prefer it, is a very strong one and is very inspiring. For the album artwork, how did you come to choose Silvia Goldhammer? Silvia, who recently graduated from university with a BA degree, is the girlfriend of Sebastian. She is very talented and we love every piece of her work. So it was clear that we asked her to do the artwork for us. We met, had a few drinks and discussed our wishes and she was free to do as she liked. When she produced the first drafts to us we were stunned. She now works as a freelance graphics artist and you can visit her website www.26daystogo.de and have a look at her work. As a band, what groups or artists do you draw inspiration from? I believe the list would be endless if we started to name bands. Every one of us prefers to listen to another kind of music. But clearly Scandinavian bands like Dark Tranquility or In Flames would be in this list. Does Adjust the Sun have any impending plans to tour in support of Devouring Worlds? At the moment only a few gigs are planned, the next being in October. The chances of doing a real tour are rather small because our jobs are not very tour-friendly. Besides that, organizing a tour is a huge task and without professional support by an agency or label even risky if you’re not well-known. Many hosts do not want to take the risk of booking an underground band because they don’t know whether their costs will be covered. One story that I will surely tell my grandchildren is from our first concert. We were playing at a band contest and the audience was quite large because the other bands also had their fans with them. When we started playing “Inner Autumn”, which is basically a heavy ballad, our singer announced the “Wall of Death” without our knowledge. All of us were like “Oh my god, what is he doing there?! He can’t… oh, he does. Nevermind.” So he split the audience and on his command they would clash in the middle of the concert hall. And they really did. It was so funny seeing them doing the Wall of Death to a ballad. In the end one person was even injured and bled. Which band or bands would you love to share the stage with? I cannot answer for the whole band but we regularly make jokes about playing at a huge festival like “Wacken”, which is really famous. Of course it would be great to share the stage with bands we draw our inspiration from, like Dark Tranquility. Personally, I'd like to play with Opeth and Ghost Brigade. I love Opeth for their quieter songs and Ghost Brigade for their powerful guitar and bass riffs. Have you worked out a timeframe for releasing the album on physical CD? Actually, you can buy a physical CD now. We have released it on 14th of July and it costs 8 EUR (about 9.77 $) plus shipping. It is a little bit more expensive than the digital download on Bandcamp but you will get the beautiful jewel case with the booklet that contains all the lyrics to our songs. How long have you been playing the keyboards, and what led to your involvement in heavy metal? I have been playing the piano since I was 10 years old. I attended a special music school and was taught composition theory and history of music and learned to play several other instruments, too. I think what led me to metal was mainly the fault of my father and my friends. My father, a musician himself, is very fond of 80s rock and metal and there was always music at home, mainly Queen and bands like that. One of my friends introduced me to Metallica and Nu Metal bands in the 90s, another one showed me the more brutal stuff like Amon Amarth and Cannibal Corpse when I was 18. I prefer rock and metal to other pop music because of the vast ranges of style, which I did not find in other music. Are there any musicians in particular who inspire your own style? I love listening to progressive rock or metal bands like TesseracT and also post rock played by Anathema, Antimatter and Gazpacho is very popular with me at the moment. When you do the “hard stuff” yourself you tend to listen to softer music. I find it an advantage because melodies play a more important role in the softer kinds of metal and rock, and when there is a strange rhythm you are forced to listen. I get lots of ideas when listening to those bands. If there was one bit of advice that you could give to a woman with aspirations to play keyboards in a heavy metal band, what would it be? Don’t be scared! I know this sounds funny, but sometimes those guys with the long hair, strange t-shirts, tattoos and bad drinking habits can be overwhelming. This goes for the band as for the audience, as well. You really have to stand your ground and know what you want. Personally, I believe that many girls should not deny themselves. It is a problem of the metal scene that sometimes, as a woman, you are not accepted as what you are. So many girls choose to assimilate themselves by wearing huge band shirts, not wearing make-up anymore and becoming louts. But you don’t have to. If you are confident and not scared, you can do it and have lots of fun! Finally, do you have any parting words for your fans and for those who may be reading about Adjust the Sun for the first time? For the ones who just heard about us for the first time: We’d love to invite you to listen to our music on Bandcamp and to welcome you on our Facebook page where we inform our fans about gigs and band-related stuff regularly. And to our fans: you are a great bunch of people and you make every concert great! See you soon! Thanks for the great interview Katrin! I'm definitely looking forward to see what the future holds for Adjust the Sun.